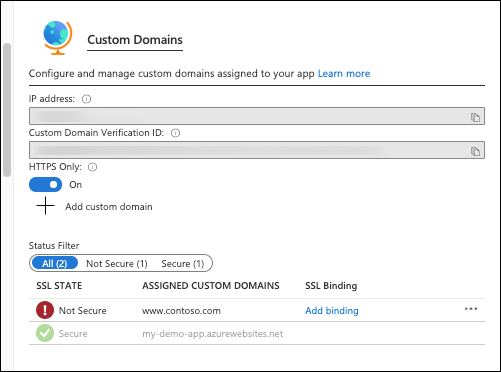 Azure App Service では、高度にスケーラブルな自己適用型の Web ホスティング サービスを提供しています。Azure App Service provides a highly scalable, self-patching web hosting service. 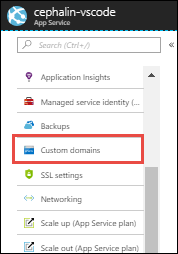 このチュートリアルでは、既存のカスタム DNS 名を Azure App Service にマップする方法について説明します。This tutorial shows you how to map an existing custom DNS name to Azure App Service. App Service アプリを作成するか、別のチュートリアルで作成したアプリを使用します。Create an App Service app, or use an app that you created for another tutorial. ドメイン名を購入し、ドメイン プロバイダー (GoDaddy など) の DNS レジストリへのアクセス権があることを確認します。Purchase a domain name and make sure you have access to the DNS registry for your domain provider (such as GoDaddy). たとえば、contoso.com と www.contoso.com の DNS エントリを追加するには、contoso.com ルート ドメインに対して DNS 設定を構成できる必要があります。For example, to add DNS entries for contoso.com and www.contoso.com, you must be able to configure the DNS settings for the contoso.com root domain. 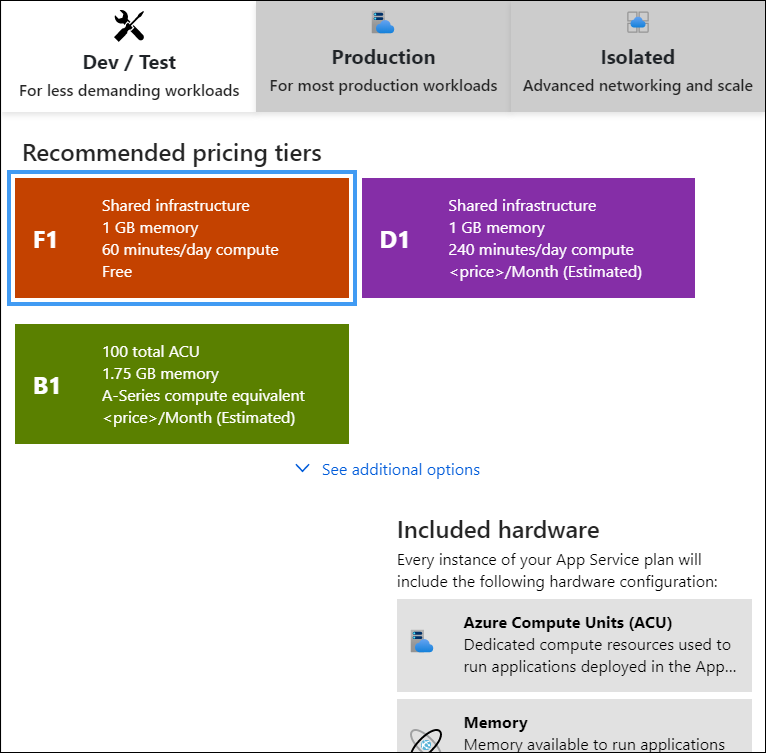 既存のドメイン名がない場合は、Azure Portal を使用してドメインを購入することを検討してください。If you don't have an existing domain name, consider purchasing a domain using the Azure portal. 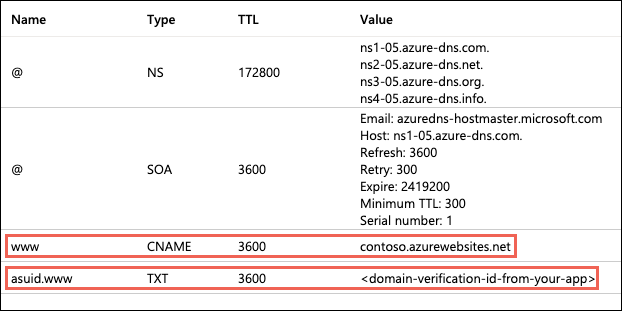 Web アプリにカスタム DNS 名をマップするには、Web アプリの App Service プランが有料レベル (Azure Functions の Shared、Basic、Standard、Premium、または 従量課金) である必要があります。To map a custom DNS name to a web app, the web app's App Service plan must be a paid tier (Shared, Basic, Standard, Premium or Consumption for Azure Functions). この手順では、App Service アプリがサポートされている価格レベルであることを確認します。In this step, you make sure that the App Service app is in the supported pricing tier. App Service の Free および Shared (プレビュー) ホスティング プランは、他の App Service アプリと同じ Azure 仮想マシンで稼働する基本レベルです。App Service Free and Shared (preview) hosting plans are base tiers that run on the same Azure virtual machines as other App Service apps. 一部のアプリは他のお客様に属する場合もあります。Some apps might belong to other customers. このレベルは、開発とテストのみでの使用を対象としています。These tiers are intended to be used only for development and testing purposes. 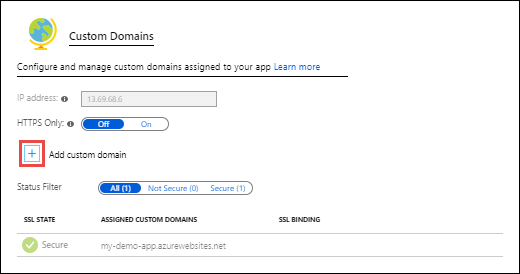 Azure Portal を開き、Azure アカウントでサインインします。Open the Azure portal and sign in with your Azure account. 左側のメニューで、[App Services] を選択し、アプリの名前をクリックします。From the left menu, select App Services, and then select the name of the app. 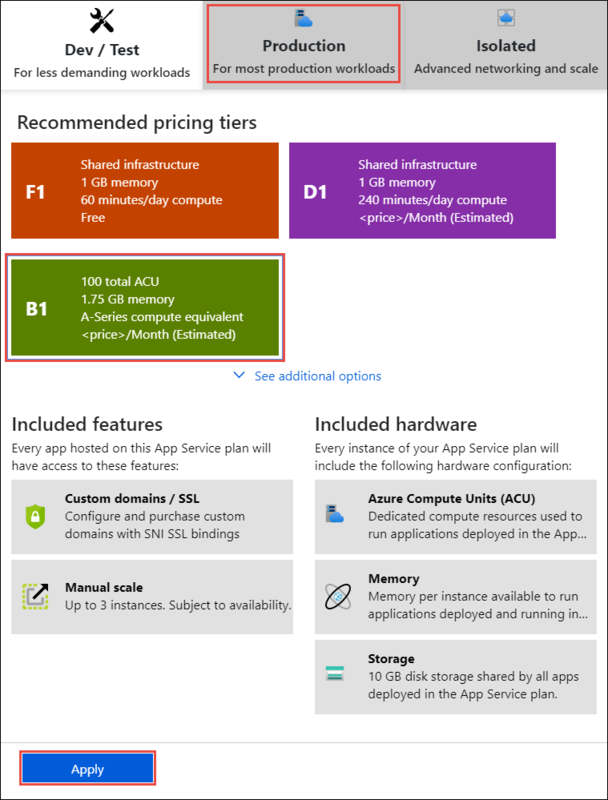 App Service アプリの管理ページが表示されます。You see the management page of the App Service app. アプリ ページの左側のナビゲーションで、[設定] セクションまでスクロールし、[スケール アップ (App Service のプラン)] を選択します。In the left navigation of the app page, scroll to the Settings section and select Scale up (App Service plan). アプリの現在のレベルが青色の枠線で強調表示されます。The app's current tier is highlighted by a blue border. アプリが F1 レベルに含まれていないことを確認します。Check to make sure that the app is not in the F1 tier. カスタム DNS は、F1 レベルではサポートされていません。Custom DNS is not supported in the F1 tier. App Service プランが F1 レベルではない場合は、[スケール アップ] ページを閉じて、「CNAME レコードのマップ」に進みます。If the App Service plan is not in the F1 tier, close the Scale up page and skip to Map a CNAME record. 非 Free レベルのいずれかを選びます (D1、B1、B2、B3、または運用カテゴリのいずれかのレベル)。Select any of the non-free tiers (D1, B1, B2, B3, or any tier in the Production category). その他のオプションについては、[See additional options](その他のオプションを参照する) をクリックします。For additional options, click See additional options. 次の通知が表示されたら、スケール操作は完了です。When you see the following notification, the scale operation is complete. ルート ドメインを除くすべてのカスタム DNS 名 (たとえば、contoso.com) には CNAME レコードを使用する必要があります。You should use CNAME records for all custom DNS names except root domains (for example, contoso.com). ルート ドメインの場合は A レコードを使用します。For root domains, use A records. このチュートリアルの例では、www サブドメイン (たとえば www.contoso.com) の CNAME レコードを追加します。In the tutorial example, you add a CNAME record for the www subdomain (for example, www.contoso.com). 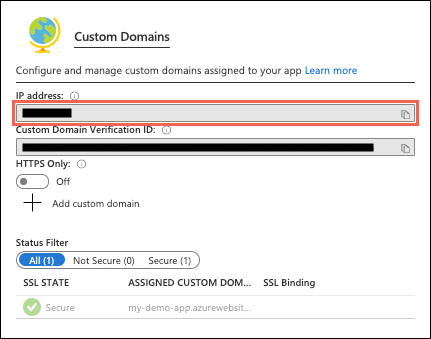 Azure DNS を使用して、Azure Web Apps のカスタム DNS 名を構成できます。You can use Azure DNS to configure a custom DNS name for your Azure Web Apps. 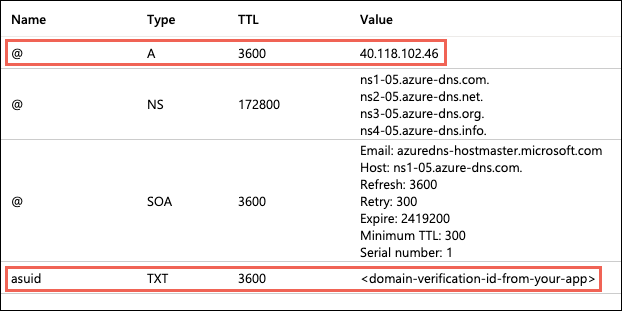 詳細については、「Azure DNS を使用して Azure サービス用のカスタム ドメイン設定を提供する」をご覧ください。For more information, see Use Azure DNS to provide custom domain settings for an Azure service. ドメイン プロバイダーの Web サイトにサインインします。Sign in to the website of your domain provider. DNS レコードの管理ページを探します。Find the page for managing DNS records. 各ドメイン プロバイダーには独自の DNS レコード インターフェイスがあるので、プロバイダーのドキュメントを参照してください。Every domain provider has its own DNS records interface, so consult the provider's documentation. [ドメイン名]、[DNS]、[ネーム サーバー管理] というラベルが付いたサイトの領域を探します。Look for areas of the site labeled Domain Name, DNS, or Name Server Management. 通常、DNS レコードのページを見つけるには、アカウント情報を表示し、[ドメイン] などのリンクを探します。Often, you can find the DNS records page by viewing your account information, and then looking for a link such as My domains. そのページに移動し、[ゾーン ファイル]、[DNS レコード]、[詳細構成] のような名前のリンクを探します。Go to that page and then look for a link that is named something like Zone file, DNS Records, or Advanced configuration. このスクリーンショットの例では、[追加] を選択してレコードを作成します。In the example screenshot, you select Add to create a record. プロバイダーによっては、追加するレコード タイプごとに異なるリンクが用意されています。Some providers have different links to add different record types. この場合も、プロバイダーのドキュメントを参照してください。Again, consult the provider's documentation. 一部のプロバイダー (GoDaddy など) では、別の [変更を保存] リンクを選択するまで DNS レコードの変更が反映されません。For certain providers, such as GoDaddy, changes to DNS records don't become effective until you select a separate Save Changes link. サブドメインをアプリの既定のホスト名 (<app_name>.azurewebsites.net、<app_name> はアプリの名前) にマップするための CNAME レコードを追加します。Add a CNAME record to map a subdomain to the app's default hostname (<app_name>.azurewebsites.net, where <app_name> is the name of your app). 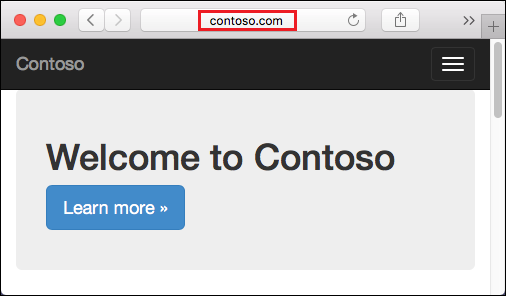 www.contoso.com ドメインの例では、名前 www を <app_name>.azurewebsites.net にマップする CNAME レコードを追加します。For the www.contoso.com domain example, add a CNAME record that maps the name www to <app_name>.azurewebsites.net. 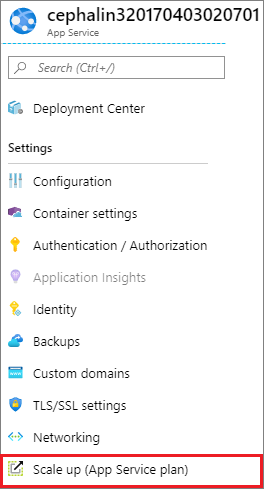 Azure Portal のアプリ ページの左側のナビゲーションで、[カスタム ドメイン] を選択します。In the left navigation of the app page in the Azure portal, select Custom domains. アプリの [カスタム ドメイン] ページで、完全修飾カスタム DNS 名 (www.contoso.com) を一覧に追加します。In the Custom domains page of the app, add the fully qualified custom DNS name (www.contoso.com) to the list. [ホスト名の追加] の横の + アイコンを選択します。Select the + icon next to Add hostname. 先ほど CNAME レコードを追加した完全修飾ドメイン名 (www.contoso.com など) を入力します。Type the fully qualified domain name that you added a CNAME record for, such as www.contoso.com. [ホスト名の追加] ページが表示されますThe Add hostname page is shown. [ホスト名レコード タイプ] が [CNAME (www.example.com または任意のサブドメイン)] に設定されていることを確認します。Make sure that Hostname record type is set to CNAME (www.example.com or any subdomain). アプリの [カスタム ドメイン] ページに新しいホスト名が反映されるまで時間がかかることがあります。It might take some time for the new hostname to be reflected in the app's Custom domains page. データを更新するために、ブラウザーの表示を更新してみてください。Try refreshing the browser to update the data. 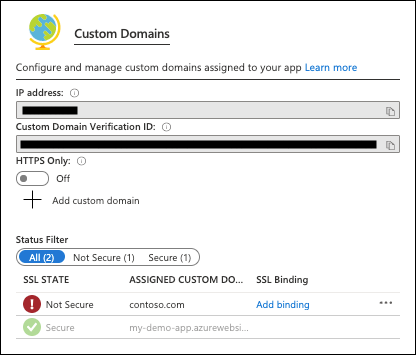 SSL バインドの追加については、「既存のカスタム SSL 証明書を Azure App Service にバインドする」を参照してください。To add an SSL binding, see Bind an existing custom SSL certificate to Azure App Service. 手順を飛ばしていたり、どこかで入力ミスがあったりした場合、ページの下部に検証エラーが表示されます。If you missed a step or made a typo somewhere earlier, you see a verification error at the bottom of the page. このチュートリアルの例では、ルート ドメイン (たとえば contoso.com) の A レコードを追加します。In the tutorial example, you add an A record for the root domain (for example, contoso.com). A レコードをマップするには、アプリの外部 IP アドレスが必要です。To map an A record, you need the app's external IP address. 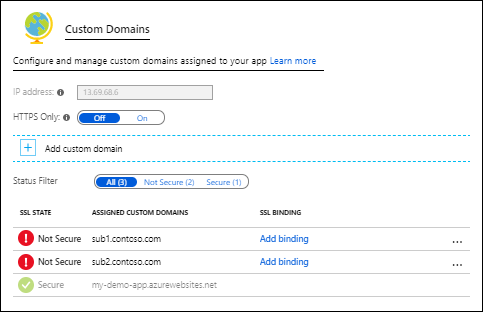 この IP アドレスは、Azure Portal のアプリの [カスタム ドメイン] ページで見つけることができます。You can find this IP address in the app's Custom domains page in the Azure portal. [カスタム ドメイン] ページで、アプリの IP アドレスをコピーします。In the Custom domains page, copy the app's IP address. アプリの IP アドレスにマップするための A レコード。An A record to map to the app's IP address. 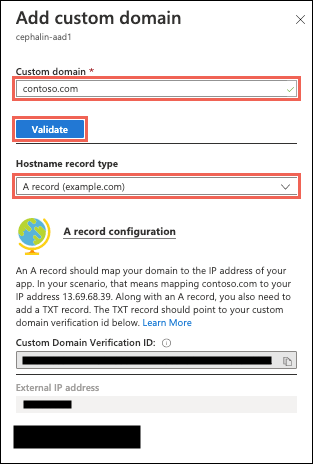 アプリの既定のホスト名 <app_name>.azurewebsites.net にマップするための TXT レコード。A TXT record to map to the app's default hostname <app_name>.azurewebsites.net. App Service は、このレコードを、カスタム ドメインの所有者であることを検証するために構成時にのみ使用します。App Service uses this record only at configuration time, to verify that you own the custom domain. App Service でカスタム ドメインが検証されて構成された後は、この TXT レコードを削除できます。After your custom domain is validated and configured in App Service, you can delete this TXT record. contoso.com ドメインの場合、次の表に従って A および TXT レコードを作成します (@ は、通常、ルート ドメインを表します)。For the contoso.com domain example, create the A and TXT records according to the following table (@ typically represents the root domain). 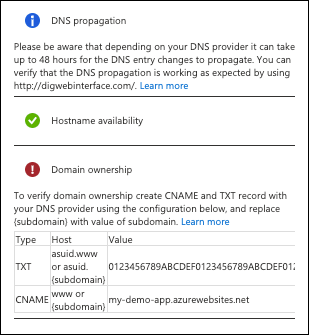 Azure Portal のアプリの [カスタム ドメイン] ページに戻り、完全修飾カスタム DNS 名 (たとえば、contoso.com) を一覧に追加します。Back in the app's Custom domains page in the Azure portal, add the fully qualified custom DNS name (for example, contoso.com) to the list. 先ほど A レコードを構成した完全修飾ドメイン名 (contoso.com など) を入力します。Type the fully qualified domain name that you configured the A record for, such as contoso.com. [ホスト名レコード タイプ] が [A レコード (example.com)] に設定されていることを確認します。Make sure that Hostname record type is set to A record (example.com). このチュートリアルの例では、CNAME レコードを追加して、ワイルドカード DNS 名 (たとえば *.contoso.com) を App Service アプリにマップします。In the tutorial example, you map a wildcard DNS name (for example, *.contoso.com) to the App Service app by adding a CNAME record. ワイルドカード名をアプリの既定のホスト名 (<app_name>.azurewebsites.net) にマップするための CNAME レコードを追加します。Add a CNAME record to map a wildcard name to the app's default hostname (<app_name>.azurewebsites.net). 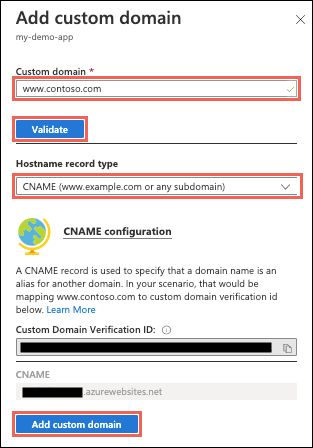 *.contoso.com ドメインの例では、CNAME レコードは名前 * を <app_name>.azurewebsites.net にマップします。For the *.contoso.com domain example, the CNAME record will map the name * to <app_name>.azurewebsites.net. これで、ワイルドカード名と一致するすべてのサブドメインをアプリに追加できるようになりました (たとえば、sub1.contoso.com および sub2.contoso.com は *.contoso.com に一致します)。You can now add any subdomain that matches the wildcard name to the app (for example, sub1.contoso.com and sub2.contoso.com match *.contoso.com). ワイルドカード ドメインと一致する完全修飾ドメイン名 (たとえば sub1.contoso.com) を入力し、[検証] を選択します。Type a fully qualified domain name that matches the wildcard domain (for example, sub1.contoso.com), and then select Validate. [ホスト名の追加] ボタンがアクティブになります。The Add hostname button is activated. [ホスト名レコード タイプ] が [CNAME レコード (www.example.com または任意のサブドメイン)] に設定されていることを確認します。Make sure that Hostname record type is set to CNAME record (www.example.com or any subdomain). + アイコンをもう一度選択して、ワイルドカード ドメインと一致する別のホスト名を追加します。Select the + icon again to add another hostname that matches the wildcard domain. たとえば、sub2.contoso.com を追加します。For example, add sub2.contoso.com. 先ほど構成した DNS 名 (たとえば、contoso.com、www.contoso.com、sub1.contoso.com、および sub2.contoso.com) を参照します。Browse to the DNS name(s) that you configured earlier (for example, contoso.com, www.contoso.com, sub1.contoso.com, and sub2.contoso.com). 構成されているカスタム ドメインに A レコードまたは CNAME レコード (またはその両方) がない。The custom domain configured is missing an A record and/or a CNAME record. クライアントのブラウザーが、ドメインの古い IP アドレスをキャッシュしている。The browser client has cached the old IP address of your domain. キャッシュをクリアして、DNS の解決をもう一度テストします。Clear the cache and test DNS resolution again. Windows コンピューターでは、ipconfig /flushdns でキャッシュをクリアします。On a Windows machine, you clear the cache with ipconfig /flushdns. 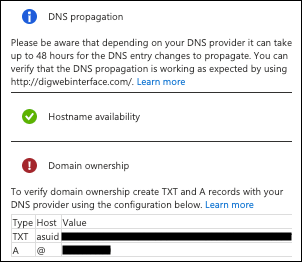 ライブ サイトとその DNS ドメイン名を App Service にダウンタイムなしで移行する方法については、「Azure App Service へのアクティブな DNS 名の移行」をご覧ください。To migrate a live site and its DNS domain name to App Service with no downtime, see Migrate an active DNS name to Azure App Service. 既定では、App Service は Web 要求をアプリ コードのルート ディレクトリに送信します。By default, App Service directs web requests to the root directory of your app code. ただし、特定の Web フレームワークはルート ディレクトリで開始されません。However, certain web frameworks don't start in the root directory. たとえば、Laravel は public サブディレクトリで開始されます。For example, Laravel starts in the public subdirectory. contoso.com の DNS の例を継続する場合、そのようなアプリには http://contoso.com/public でアクセス可能ですが、実際は http://contoso.com を public ディレクトリに転送したいと考えます。To continue the contoso.com DNS example, such an app would be accessible at http://contoso.com/public, but you would really want to direct http://contoso.com to the public directory instead. この手順に DNS の解決は含まれませんが、仮想ディレクトリのカスタマイズは含まれます。This step doesn't involve DNS resolution, but customizing the virtual directory. これを行うには、Web アプリ ページの左側のナビゲーションで [アプリケーション設定] を選択します。To do this, select Application settings in the left-hand navigation of your web app page. ページの下部でルート仮想ディレクトリ / が既定で site\wwwroot をポイントしていますが、これがお客様のアプリ コードのルート ディレクトリです。At the bottom of the page, the root virtual directory / points to site\wwwroot by default, which is the root directory of your app code. たとえば、代わりに site\wwwroot\public をポイントするように変更して、変更内容を保存できます。Change it to point to the site\wwwroot\public instead, for example, and save your changes. 操作が完了すると、アプリからルート パスの正しいページが返されます (http://contoso.com) など)。Once the operation completes, your app should return the right page at the root path (for example, http://contoso.com). 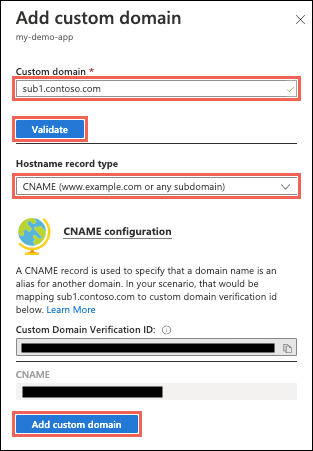 Azure CLI または Azure PowerShell を使用すると、カスタム ドメインの管理をスクリプトで自動化できます。You can automate management of custom domains with scripts, using the Azure CLI or Azure PowerShell. 次のコマンドでは、構成済みカスタム DNS 名を App Service アプリに追加します。The following command adds a configured custom DNS name to an App Service app. 詳細については、「カスタム ドメインを Web アプリにマップする」を参照してくださいFor more information, see Map a custom domain to a web app. 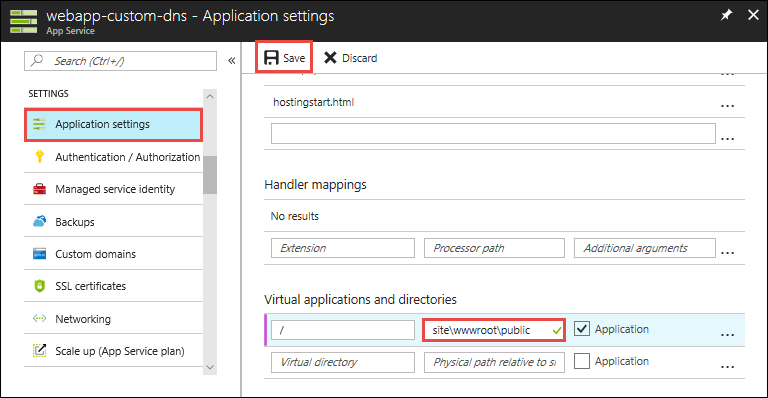 この記事は、新しい Azure PowerShell Az モジュールを使用するために更新されました。This article has been updated to use the new Azure PowerShell Az module. Az モジュールと AzureRM の互換性の詳細については、「Introducing the new Azure PowerShell Az module (新しい Azure PowerShell Az モジュールの概要)」を参照してください。To learn more about the new Az module and AzureRM compatibility, see Introducing the new Azure PowerShell Az module. インストール手順については、Azure PowerShell のインストール を参照してください。For installation instructions, see Install Azure PowerShell. 詳細については、「カスタム ドメインを Web アプリに割り当てる」を参照してください。For more information, see Assign a custom domain to a web app. 次のチュートリアルに進み、カスタム SSL 証明書を Web アプリにバインドする方法を学習してください。Advance to the next tutorial to learn how to bind a custom SSL certificate to a web app.